Sieta is a sad little girl. She sees pictures in her mind of the good times with her parents before they sickened and died and her Auntie brought her to the place she calls ‘home now’. But she cannot smile, and she cannot really connect to this new place over the mountains she has been brought to. Then one day her school is taken to see an orphanage for young elephants, and when Sieta sees baby Satara, she recognises a fellow sufferer. She goes back to see him on her own, and through fellow feeling with the little elephant comes to accept Auntie and her new home. 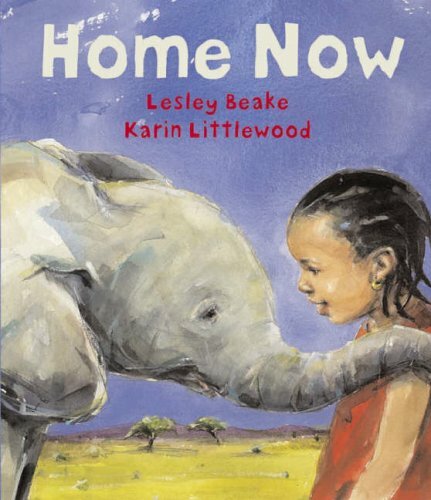 So much is not said in this lyrical story, and so much is expressed through the pictures – lovely watercolours suffused with African colours of pinks and oranges and blues. No mention is made of AIDS, but that is at the heart of Sieta’s unhappiness. This is made clear by a note for adults on the final page. The author has lived in South Africa for many years, and some aspects of the story are true. A powerful tale to teach about loss and the power of love.